Akti continues to be one of my favorite Greek restaurant in Astoria. To show off its culinary prowess, I took my family and my family friends there for a Greek meze feast. We enjoyed ourselves and our friends loved this authentic "taste" of Astoria. The octopus especially stood out as well as Akti's wonderful dips and grilled pita. Portobello Mushroom Salad - We were in the mood to start with something fresh and healthy prior to the fish and chicken courses. This salad made a great impression, as it was full of tasty fresh veggies, some of which were grilled such as the portobello mushrooms. 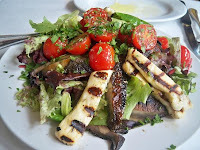 I loved the thin strips of grilled goat's cheese that rested on top of the greens, adding protein and body. The dressing was a simple lemon juice and olive oil with salt and freshly ground black pepper--a nice, finish with a moderate amount of acidity. 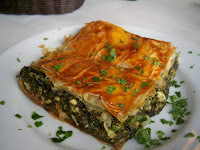 Spanakopita (Spinach Pie) - A signature Greek dish, we were curious how it'd measure up. Quite well but it wasn't my favorite spinach pie in Astoria, as I prefer Opa Opa's version a little bit more. The filo dough on top was lovely and had a well-done golden crust. The filling of spinach and feta cheese was flavorful and a little bit creamy. It wasn't heavy at all, which is something this food is often criticized for. Overall, a solid option that's conducive to sharing. Falafel - Yum! Another home run. 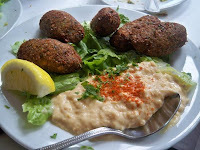 I loved how crunchy the falafel ovals were on the outside and how soft and chunky on the inside. They were flavored beautifully and weren't bland at all, the hummus served on the side a nice embellishment. They went a little too heavy on the tahini, but overall it was a good complement to the falafel. 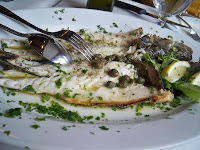 Black Sea Bass - I adore Akti's grilled fish and we sampled a black sea bass. It was extremely light and flaky, seasoned simply with olive oil, salt, pepper and giant green capers. The capers were the best part, as they added a little zest and provided a jolt to the senses. All of their fish is on the bone but the small bones are cleaned off so you don't have to worry if you're uncomfortable with that sort of thing. Chicken Souvlaki - We also got a chicken souvlaki platter for the sake of variety. It looked impressive on enormous skewers with grilled veggies and a side of lemon potatoes. While I enjoyed it, I thought that the meat was a little dry and maybe a bit overcooked. The potatoes were fantastic and just slightly flavored with lemon, which wasn't overpowering. The service at Akti continues to be great. Our server was polite and made good recommendations. My only complaint was that they were a bit slow with changing our plates but otherwise, everyone was fantastic. We especially loved the complimentary, palate-cleansing wedges of fresh watermelon at the end of our meal. Very considerate! Costs are wallet friendly, and for a party of 8, ordering 8 meze and two main courses set us back $124 without tax and tip. This comes out to about $15 per person, which is incredible! how's the price range at Akti? Jill - I agree with you 100%! The price point is affordable ($6-$13) for meze and the fish is all market price (between $18-$22 usually). Akti is awesome...up there with Elias Corner.